The grandaddy of all things sweet, Pierre Hermé’s intention is to ‘leave your senses quivering with pleasure’ when you bite into the thin, crisp shell of his macarons. His first store opened in Tokyo in 1998, a year after his involvement with Ladurée’s expansion. He now has 10 stores in the Japanese capital, 11 in Paris, three in London and three in our fair city. His unusual-yet-balanced range of flavours includes olive oil and vanilla and the unrivalled passionfruit and milk chocolate. All hail Pappa P! Prices start from $220 for a box of seven. Various locations inc Shop 1019C, 1/F, IFC mall, 8 Finance St, Central, 2833 5700; pierreherme.com. In centuries past, Dalloyau’s products were endorsed by the French ‘Sun King’, Louis XIV. Now they seem to be endorsed by countless sweet lovers in Hong Kong. The brand’s collection of indulgent flavours includes yuzu citrus fruit, alongside some quality chocolate. Not extravagant enough? Well, for a truly luxurious experience, go for the ‘cognac fine champagne’ variety. Like the liqueur, this boozy macaron rounds off a meal with aplomb. The secret to Dalloyau’s success is the addition of a homemade almond paste in the biscuit, which is preservative-free and uses only natural colourings. $24 or $228 for a box of nine. Shop 403, 4/F, Ocean Ctr, Harbour City, 3-57 Canton Rd, Tsim Sha Tsui, 3185 8330; dalloyau.hk. Jean-Paul Hévin’s macarons have earned themselves some top accolades, thanks to their light texture and low sugar content. And it’s no surprise that the chocolate-flavoured ones are food-gasm inducing, created as they are by a chocolatier. Made with a pure choc ganache, the treats exhibit characteristics of the cocoa beans’ origin. The delectably intense tana macaron uses cocoa from Madagascar, which has hints of citrus fruits and berries. 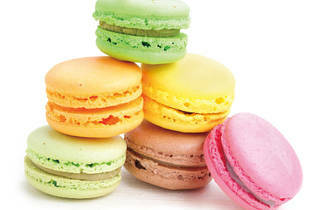 It was awarded Best Macaron of Paris in 2012. We give it Best of Hong Kong in 2016. $26. $145 for a box of five. Shop 212, Ocean Ctr, Harbour City, Tsim Sha Tsui, 2735 3268; jeanpaulhevin.com.hk. Founder of Jouer, Anne Cheung, grew up in Hong Kong and trained as a chef in France. Thus, her style is a convergence of both influences. There are plenty of fun Hong Kong-inspired macarons at the quaint and quirky Jouer eatery in Wan Chai, which also sells homeware and boasts curiosities and pastry installations such as macaron ‘trees’. We love some of the flavours that are based on much-loved cha chaan teng beverages like Hong Kong-style milk tea, Horlicks and salted lime 7-Up. With one branch conveniently located in Central, we can always enjoy the savoury French flavours, including the onion soup and the foie gras and sauternes. They’re not cheap but they are unique. $18. Prices start from $100 for a box of six. Various locations inc 1 Sau Wa Fong, Wan Chai, 2528 6577; jouer.hk. Joël Robuchon’s more relaxed outlet at the IFC mall is known for its delicate pastries, sandwiches, salads, cakes and popular afternoon tea. 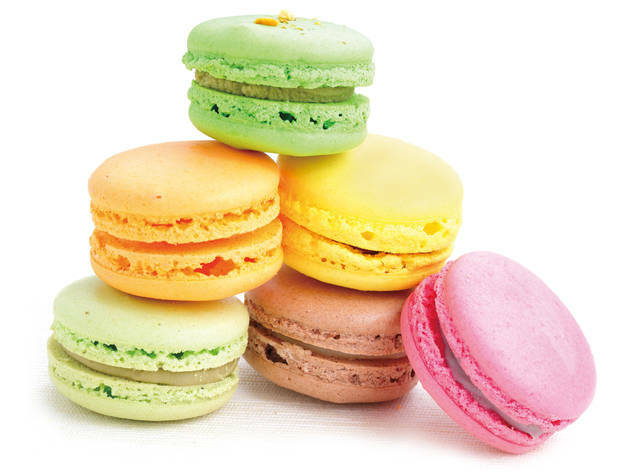 Not to be overlooked, though, are the outstanding macarons, which boast a more prevalent almond flavour compared to other biscuits in the city, thanks to the use of fresh dried almonds instead of the powdered variety. It’s quality over quantity at the eatery as the flavour selection isn’t as vast as other outlets, but the delicate flavours such as chocolate, praline and passionfruit, as well as the traffic light trio of rose, lemon and pistachio, are definitely some of Hong Kong’s best. $25. Prices start from $70 for a box of two. Various locations inc Shop 2045A, 2/F, IFC mall, 8 Finance St, Central, 2234 7422; robuchon.hk. The pioneer of the double-decker macaron, Ladurée was the genius that took two almond and egg white biscuits and filled them with ganache, creating the style we love today. This patisserie’s steadfast flavours include liquorice and the salted butter caramel. It’s currently selling a cherry blossom flavour, right in time for sakura season in Japan. $26. Prices start from $208 for a box of eight. Various locations inc Kiosk G, 3/F, Times Square, 1 Matheson St, Causeway Bay, 2509 9377; laduree.com.